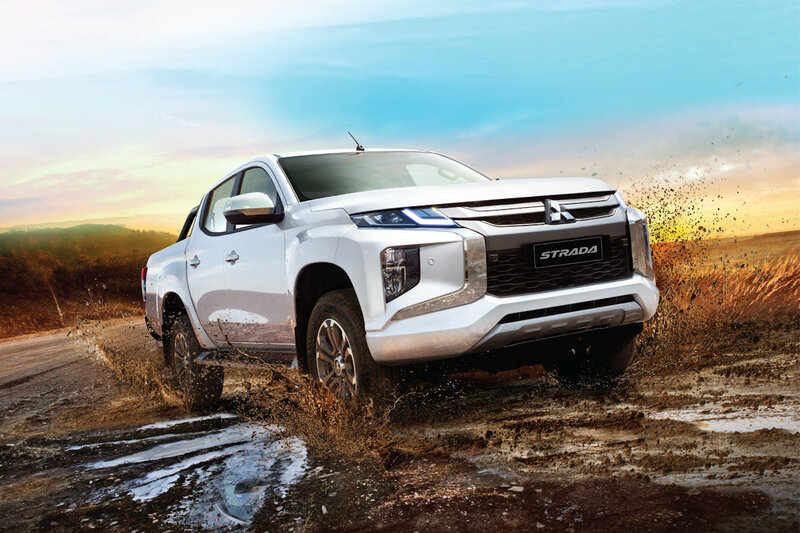 Mitsubishi Motors Philippines Corporation (MMPC) officially unveils the New 2019 Strada two months after its global premiere in Bangkok, Thailand and a week after we got hold of its specs and prices. Considered as one of the most important models of Mitsubishi Motors the new Strada will be available in 6 variants—all fitted with a 6-speed transmission. Available variants are GT 4WD Automatic Transmission (A/T), GLS 4WD Manual Transmission (M/T), GLS 2WD A/T, GLS 2WD M/T, GLX Plus 2WD A/T, and the base model GLX Plus 2WD M/T. With 40 years of pick-up truck heritage, the 2019 Strada is engineered to go beyond toughness by exceeding customers’ expectations. Knowing that this vehicle is used both for private and commercial purpose and as a reliable workhorse the new Strada is designed to be more durable, more reliable and more capable and adding even more comfortable ride. Under the design concept “Rock Solid” which embodies a strengthened inside and out, the New Strada flaunts the new-generation “Dynamic Shield”. The refreshed design communicates a powerful and reassuring sense of protection. The high hood and functional LED lamps layout communicate an even studier look. LED projector type head lamps are harmonized with grille design and projector lamps (GT 4×4 and GLS 4×4) to express a wider and more stable image. The newly sculpted body curves with contrasting sharp lines expresses a modern and toughness of Mitsubishi Motors’ pick-up. The front-to-back character line expresses a sense of space and the thickness of the overall body. Complementing its stunning design, the New Strada is available in 7 exterior colors: White Diamond, Graphite Gray Metallic, Sterling Silver Metallic, Jet Black Mica, Red Solid Clear, Grayish Brown Metallic, and Impulse Blue Metallic. An enhanced robustness and functionality greet occupants inside the 2019 model. Inside the 2019 Strada is a functional and modernized center panel and console. All variants feature 2-DIN infotainment system with a touch screen monitor, tuner, MP3 player, USB, iPod-ready Auxiliary-in, and Bluetooth with Mirror Link feature. All variants are also equipped with GPS Navigation System. For passenger convenience front smartphone tray is available which includes USB terminals. A Rear smartphone tray is also available and is located at the in rear of the center console including a USB power socket. The new Strada also boasts a roomy interior which can comfortably seat 5 adults, thanks to the unique J-Line design that offers a class-leading legroom for an enhanced comfort. The New Strada is powered by 2.4-liter MIVEC Clean Diesel engine with 181 horsepower at 3,500 rpm and 430 Nm of torque at 2,500 rpm. The ride is improved with the use of larger rear dampers while braking performance was also improved with the use of larger front discs and caliper pistons (GT 4×4, GLS 4×4 and GLS 4×2). The GT 4WD A/T is equipped with Super Select 4-Wheel Drive and the GLS 4WD MT is fitted with Easy Select 4WD which delivers optimum traction and handling characteristics on any given road condition. Safety will never be compromised as the 2019 Strada hosts an array of passive and advanced active safety features. It carries the proprietary Mitsubishi Motors’ RISE body (Reinforced Impact Safety Evolution) which absorbs the impact of collision. Active Stability Traction Control (ASTC), Hill Start Assist (HSA) and Trailer Stability Assist (TSA) are now standard on all variants. The top of the line variant (GT 4×4) of the New Strada is equipped with Forward Collision Mitigation system (FCM) which can detect vehicles and pedestrian ahead preventing or reducing impact of collision. It also has the Ultrasonic Misacceleration Mitigation System (UMS) which prevents accidents resulting from improper use of accelerator when moving off or reversing. Blind Spot Warning (BSW) is also standard on the GT 4×4 variant. With the BSW, sideswiping is prevented when changing lanes by detecting vehicles behind or at the rear quarter and alerting the driver thru an audible alert and flashing light. An additional P 15,000 is levied on the new premium White Diamond color. We'll post it when we get a copy. What type of wheels are on the GLX Plus 2wd? 17" Rims or alloys?